Where do you hold your classes? The Independent Presbyterian Church (at the corner of Bull Street and Oglethorpe Avenue in the historic district) graciously hosts our Grammar School classes in the Axon Education Building, our Logic School classes in the Oglethorpe Room, and our Rhetoric School classes in the Whitaker Street Building. What is the size of your student body? Currently, Veritas Academy has more than 170 students enrolled in Pre-Kindergarten through 12th Grade. Veritas offers small class sizes with approximately 10-15 students per classroom teacher. Veritas Academy is accredited by theAssociation of Classical and Christian Schools (ACCS). Is Veritas affiliated with any religious denomination? Veritas Academy is an explicitly Christian school. Our doctrinal foundation is Presbyterian and Reformed. Our Board, Staff, and Faculty hold to the basic doctrines espoused in the Westminster Confession of Faith. You can learn more about our faith foundation in our Statement of Faith. What is a classical school? By “classical,” we mean that Veritas Academy is classical in content and methodology. The core of the curriculum is an integrated study of the humanities. History is studied in depth and its time-line provides the structure to which we peg great and time-proven literature, music, and art. Methodologically we follow the classical Trivium of Grammar (with substantial memorization at the elementary school level), Logic (learning to argue correctly in middle school), and Rhetoric (emphasizing polished oral and written presentations in high school). For a deeper look at the mechanics of classical education compared to more contemporary approaches, see our “What is Classical Education?” resource. What do you mean by “Christian school”? As a Christian school, our mission is to exalt Jesus Christ as the One by Whom, through Whom, and for Whom all of creation exists. As He is the Truth (‘Veritas’ in Latin), all truth is His truth, and all education must be provided under His lordship. This means that every subject is taught as part of an integrated whole from the perspective of a Christian worldview. Our students are trained to develop a Biblical worldview so that they will think God’s thoughts after Him, discover His hand at work in every realm of existence, and pursue truth, beauty, and goodness all of their days. Our carefully selected faculty, staff, and board model Christian living and encourage each student to grow in faith. What is a condensed school day? By “condensed,” we mean a shortened but focused and full schedule. Because Veritas Academy is family-based, parental involvement is encouraged, indeed, required. Consequently, the Veritas Academy Grammar Stage requires considerable at-home involvement by parents. Additionally, we are a home-school friendly institution, thus a majority of our classes are open to home-school students as needed. Class hours are 8AM-12PM for grades Pre-K through 6, and 8AM-1:30PM for grades 7-12. What does a Veritas student’s day look like? School mornings are taken up with academic classroom work. This includes mathematics, language arts, Latin, history, and science. Afternoons are devoted to home-based academic work, requiring considerable involvement of parents. We expect a significant block of time to be committed to reading, homework, and other educational activities at home. However, our condensed day philosophy allows family-based and enrichment pursuits to be enjoyed at a more leisurely pace. 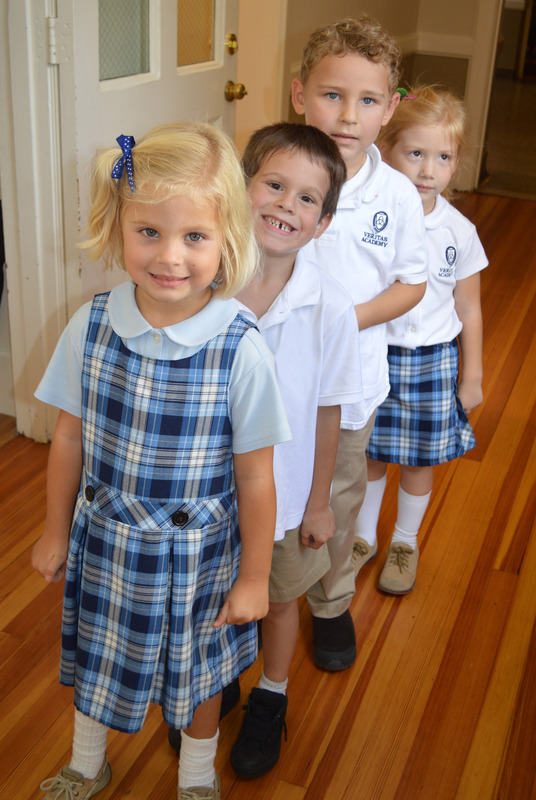 Students in our Grammar School, grades Pre-K through 6, attend class from 8AM-12PM. They are then either dismissed to go home, or may choose to stay for our extended day options. Extended day classes dismiss at 1:45PM. Students in our Logic and Rhetoric Schools, grades 7-12, attend class from 8AM-1:30PM with a lunch break around noon. Extended day classes are available to Logic and Rhetoric students from 1:45PM-3:05PM. Tuition rates at Veritas range from $3390 annually for our 3-day Pre-K program to $7720 annually for Rhetoric School. Please see ourTuition pagefor specifics. At least one parent must be a Christian, having a credible profession of faith in Christ and being a member of a Christian church. After an application is submitted, families are interviewed, and students are tested for placement in the correct grade level. We are not staffed to accommodate students with serious learning disabilities. Veritas Academy does not discriminate on the basis of race, color, nationality, or ethnic origin. Does Veritas offer extracurricular activities? Yes, including drama, art, music, heath, field trips, and athletics. Please see our Athleticsand Extended Day pages for more information.